RAWALPINDI: At least two soldiers were martyred and four others injured in a terrorist attack on a checkpost near the Pak-Afghan border in Bajaur Agency on Monday, the Inter-Services Public Relations (ISPR) said in a statement. “Terrorists from [the] Afghanistan side attempted [an] attack on Pakistani posts along [the] Pak-Afghan border in Bajaur Agency. The attempt was effectively responded killing 8-10 fleeing terrorists while many seen running back [were] injured,” ISPR said. 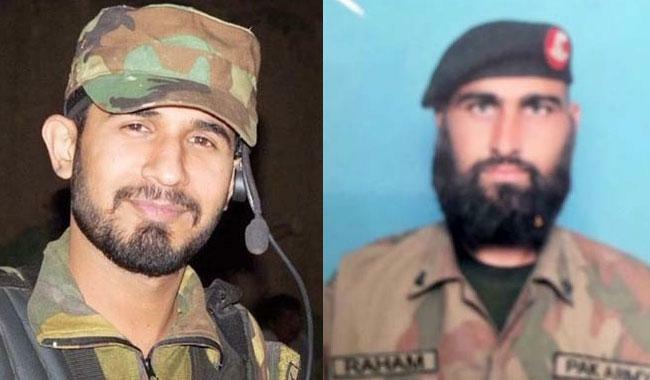 The martyred soldiers were identified as Captain Junaid Hafeez and Sepoy Raham. “The absence of Afghan [state] writ on [the] Afghan side of the border, like many other areas, facilitate terrorists to undertake such attempts,” the ISPR said. The incident comes days after a similar attack on a checkpost at the border in Rajgal Valley left one soldier martyred. Following the cross-border attack, ISPR chief Major General Asif Ghafoor said that Pakistan was paying the price for security vacuum on the Afghan side of the border. The ISPR director general said Pakistan has done its part, including elimination of terrorists from all areas, border fencing, building new check posts, enhanced presence along Pak-Afghan border and established of crossing points. Talking about the militant hideouts in a war-torn Afghanistan, General Ghafoor said: “It now requires the elimination of terrorist sanctuaries in Afghanistan and effective Afghan border security.” Lives of forces and citizens equally precious on both sides of the border, he said, adding that more efforts were required on Afghanistan side by all the stakeholders. The ISPR in August had announced the conclusion of Khyber-4 Operation in Khyber Agency which included clearing the areas on the Pakistani side of the border. Pakistan began fencing the Pak-Afghan border earlier this year to prevent terrorists from crossing into the country from Afghanistan. The two countries accuse the other of harbouring their militant enemies — both deny the other’s charges. Afghanistan is a stolen land of Central Asia & Iran and it is infested with terrorists. Pakistan must deport all Afghan refugees because their government does not care that our civilians & soldiers are being killed by terrorists in Afghanistan. Make Afghanistan face the consequences ! Absolutely right & we must demand Wahabi Arabia & Zionist USA to immediately stop providing support to these brain dead Scum.